Brief Description: On The Buses was a classic British situation comedy, created by Ronald Wolfe and Ronald Chesney, which ran for seven series from 1969 to 1973, and introduced a host of much-loved memorable characters. The series followed the ups and downs of life ‘on the buses’ as portrayed by two work shy-busmen, Stan Butler (played by Reg Varney) and his mate Jack Harper (Bob Grant) as they invented new scams to wind up their long suffering boss, inspector Cyril ‘Blakey’ Blake (Stephen Lewis). This book tells the whole 'On The Buses' story from its inception through to the three spin-off feature films it spawned. It includes details of cast, crew, locations and the many famous faces and catch phrases which made-up one of the most popular sitcoms ever to appear on our TV screens. On The Buses aired in an era where entertainment was unrestrained by politically correct rules but hilarious scripts and quality acting guaranteed the series a legion of loyal fans around the globe. This book is a must have for anyone interested in learning more about On The Buses – an example of British sitcom at its best. Special Note: This book is also available as an eBook. The hardback version of this book is now out of print. An old edition of the paperback version carries the following ISBN: 978-1-782818-51-9. About the Author: Born in 1968, Craig runs the original On The Buses forum and organises the annual On The Buses event in Borehamwood, he is a big fan of British comedy shows. He currently lives in Edinburgh. (Picture Right: Craig Walker with actress Anna Karen). This book is a fascinating read - fabulous! A labour of love from a life long fan of the series. The book is an amazing reference to everyone connected with this tremendous 70's series Full of personal and happy memories for me, and a necessary addition for fans and TV historians alike. (Photo: Hal Dyer with a copy of 'On The Buses: The Complete Story'). A great book to dip into while you are waiting at a bus stop. It's timeless, just like 'On The Buses'! Here is a well researched book full of information to please all fans. It is a must for all fans. It is certainly about time that this classic television sitcom was put into a book, this is the complete story of On The Buses and covers every aspect of the complete series and the three spin-off films. Craig has thoroughly researched this book and I would recommend this to all true comedy fans, if you didn't know about On The Buses before you'll certainly will after reading this remarkable book, 'oh I 'ate you Butler'. 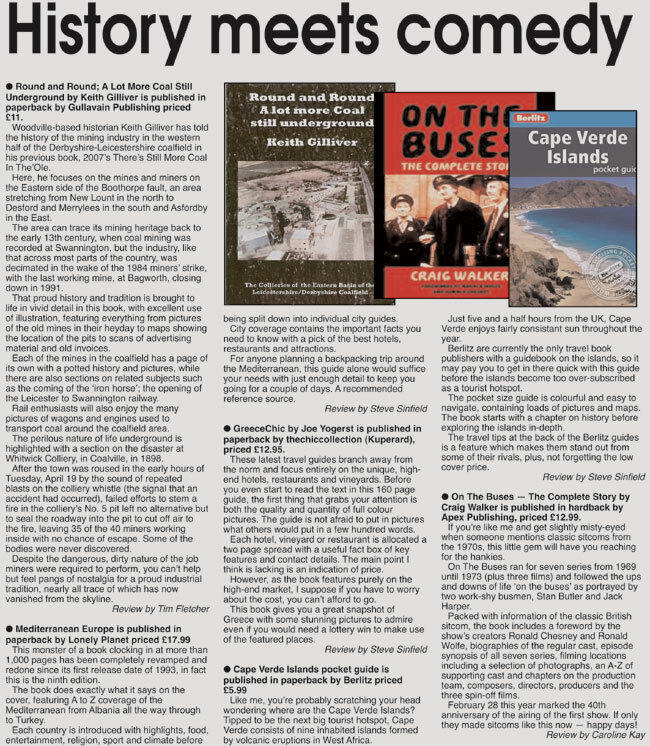 It is very gratifying to be asked to write the foreword to a book on a subject we know very well – the TV sitcom series ON THE BUSES – and which contains a mine of information, some of which we were not familiar with, and are now very grateful to learn about .. The details which Craig Walker has unearthed are quite staggering. They cover every episode and every aspect of the series and the book is a cornucopia of facts covering - well, just about everything a fan would ever want to know about. Fascinating details as well about the making of the three OTB feature films which followed. As we write, ON THE BUSES has just celebrated its 40th birthday; it is hale and hearty, and still in very good health. Let us go back to 1969, the year it was born. Having earlier written two successful TV series, THE RAG TRADE and MEET THE WIFE, it was time, we hoped, for another hit show. We had been working for some time on an idea about a bus driver and his life both at work and at home. Only just a short time before, London Weekend Television started operating, and although it opened in a blaze of glory and high hopes, its first year was pretty much a disaster. So now they were desperately looking for some new shows, For us it couldn’t have been better timing, or a better opportunity. At this time, Frank Muir was Head of London Weekend Television’s Light Entertainment Department. We knew Frank from way back, when, with his then writing partner, Denis Norden, he wrote extremely successful radio and TV sitcoms. We got in touch with him, made an appointment, and headed for LWT. We remember it well. It was five o’clock on a Friday afternoon. We handed him the Format which he skimmed through with his practised eye. Did we see the semblance of a smile? He then dashed off to have a quick word with Cyril Bennett, the Programme Controller. At roughly twenty-past-five we were offered a contract – pretty surprising really, as only the previous week this same format was rejected by the BBC. The title we had decided on was ON THE BUSES which we thought said everything. We had given the show a great deal of thought over a great deal of time, and knew that if most of the cast were featured in uniform, they would be immediately identifiable. There would be two different set-ups - life at the bus garage and in the home. We figured that these two situations would give rise to the many conflicts arising in both camps. So, with the idea approved by London Weekend Television, we wrote the first script and several storylines. Things went well up to that point, but we then had to go through the agonising game of chance called “casting”. We knew both by instinct and by his past performances that Reg Varney would be perfect as the bus driver. By a stroke of luck, Stuart Allen, producer/director of most of the series, and really great at casting, led us to Stephen Lewis who was chosen as The Inspector. He had been working in a production at Stratford East called “MRS.WILSON’S DIARY”, and in that same show was Bob Grant who was invited to play the part of Jack, the Conductor. We didn’t have to look too far for the role of Stan’s mum – the first and immediate choice was Doris Hare. Alas, she was out of the country with her husband, a Professor of Medicine, who was attending a Seminar. So, Cicely Courtneidge was booked for the first series, on the understanding that if the show was successful and continued, she would be replaced by Doris. Which is how it turned out. The part of Olive was much more difficult. There are not many actresses who would have been willing to take on the role of Stan’s sister, a plain, dumpy, somewhat thick, and most unattractive lady. And then we thought of Anna Karen, who we had cast in an earlier sitcom in which she had to play a similarly unattractive role, and which she did magnificently. And it certainly wasn’t typecasting; in reality she is a most attractive lady, and it needed a great deal of work on the part of the make-up department before she began to look as she appeared in the show. Michael Robbins, who played the part of Olive’s husband, Arthur, was just perfect for the part. So, we had our main cast, and it was now up to the viewers, once the show was transmitted, to declare it a hit or a miss! Well, the show was reckoned by a lot of people to be crude and vulgar – very working-class. But this was the kind of show we wrote and seemed to be quite good at. Very predictably, it was panned by the critics. The reviews were pretty awful … But the viewing figures were huge – it grew to 16 million, and ON THE BUSES very soon climbed to the top of the ratings. As far as the public were concerned, it was a series not to be missed. Before long, the actors became overnight celebrities. They were recognised and mobbed by autograph hunters, and when the show was at its height Bob Grant got married at Caxton Hall. Of course, the whole cast attended and the police had to control the crowd which was estimated to run into several thousand. So our TV sitcom, which started life 40-years ago without any fanfare or much publicity, became an unexpectedly huge hit, and with the advent of DVDs and occasional repeats, looks as though it still has some mileage. If you are already a fan, read the book and enjoy. If you are not a fan, read the book, enjoy, and become one. For us, it has been an incredible journey of nostalgia – which, to quote the logo of the ON THE BUSES Fan Club, never goes out of fashion! A must for all fans of early TV comedy and also vintage transport. A hugely enjoyable read, and a 'must-have' for anyone from the generation of iconic sitcoms. Essential reading for all 'On The Buses' fans. Reminds you of all you half remembered and tells you much you didn't know. FANS of classic comedy ON The Buses can enjoy watching the show as it appears periodically on channels like Gold and Dave. But they now have a permanent reminder thanks to the release of 'On The Buses - The Complete Story' written by Craig Walker and published by Apex Publishing Ltd. It charts the history of the series that ran from 1969 to 1973 and followed the ups and downs of the work-shy busmen Stan Butler and Jack Harper, played by Reg Varney and Bob Grant. They constantly played out a battle of wits with long-suffering inspector Cyril 'Blakey' Blake, aka actor Stephen Lewis, who recently popped up on Last of the Summer Wine. This book tells the story of the series from its inception, through to the three spin-off feature films it created as well as details of the cast, crew and locations. A biography of all the main characters appears, followed by a brief look back at every episode including when it was first broadcast and every member of the cast. But behind the well-known faces of the main platers was a dedication team of producers and crew and recognition of this is given in the form of their details. Rounding off this fascinating look back at an entertaining classic are details of key locations, including the garage, as well as the many supporting cast members. 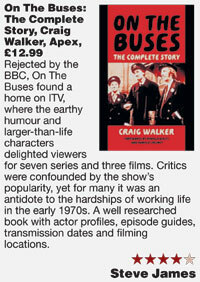 Well illustrated, On The Buses - The Complete Story by Craig Walker is available now. Everything you ever wanted to know about one of the UK's most iconic series. So comprehensive it could almost be described as an 'omnibus' edition. Remember ON THE BUSES with Stan, Jack and Blakey, not forgetting the delightful Olive and her layabout husband Arthur, plus of course dear old Mum. Well now you can hop back on board with this book that is a must for all fans. So have a seat, relax and take an enjoyable trip down Memory Lane. It was irreverent - some say racist - and definitely politically incorrect, but hand on heart few aficionados of comedy can say that they never enjoyed On The Buses. This definitive work on one of Britain's most hilarious sit-coms is a veritable goldmine of information, and should not be missed. As the News of the World masthead used to say, "All Human Life is Here" - and it is, as far as Reg Varney and his fellow actors are concerned. Craig Walker skillfully blends facts with narrative and breathes new life into a golden era of comedy. Both fascinating and hilarious. This book written by Craig Walker is a must for all fans, and is a must for anyone who liked any of the classic comedies. It has been filled with facts, whilst still keeping its entertaining momentum. It’s the first of its kind for On The Buses, once you have read this book you will know nearly everything to do with the show. It gives information on all of the stars, behind the scenes crew, all the episodes and all three spin off films. This classic comedy is summed up in this one book. An excellent and entertaining read. An interesting summary of a much loved show. 'On The Buses: The Complete Story' is a basic yet informative look at the resumes of the cast that made it and a look at each episode and film in more detail. Recalling the longest running series of ITV in television history and remembering the now deceased legends of comedy. A remarkably in-depth reference work. Everything you could want to know about On The Buses, and the cast and crew that worked on the comedy. OLIVE: Ooh, this baby's kicking me. ARTHUR: He's probably playing football with all them pickled onions you've been eating. This type of exchange between hapless housewife Olive and her cold-hearted, permanentally paper-reading hubby Arthur had 16 million people flocking round their TV sets every week. Stick that in your pipe and smoke it, Simon Cowell! On The Buses ran for seven series from 1969 to 1973 - some episodes were filmed in black and white due to a technicians' strike - and gave us characters such as slackers Stan and his clippie mate Jack plus Inspector Blake, or Blakey, who was the Norris Cole of his day. This classic British sitcom is the subject of a new book, On The Buses: The Complete Story, penned by Craig Walker with forewords by writers Ronald Wolfe and Ronald Chesney and published by Apex Publishing Ltd.
Craig runs the original On The Buses forum and he's left no bacon butty unturned in this 240 page hardback, which retails for £12.99. 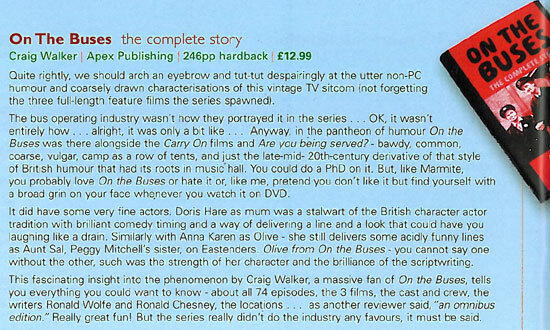 The book details the actors who brought the show to life - Anna Karen, who played Olive was a former exotic dancer and Reg Varney a highly talented pianist - then goes into a synopsis of each of the 74 episodes. Writers and producers earn some space too and I particularly enjoyed the details about the filming locations and accompanying photos. To round off, there's an A to Z of all the actors who appeared in the show and you probably won't be surprised to find the likes of Arthur Mullard, Yootha Joyce and Bob Todd. THE author of a book detailing the rise and fall of British telly classic On the Buses is set to drive up a storm when he hosts a book signing. Craig Walker has penned a fact-filled tome in tribute to the ITV sitcom which ran between 1969 to 1973. The show was a huge favourite with telly watchers who were left in stitches by the antics of bus driver Stan Butler and his run-ins with tyrannical inspector Cyril ‘Blakey’ Blake. Now Craig is set to pull-up at the Abbey Bookshop in Well Street, Paisley, on Saturday to sign copies of On The Buses – The Complete Story from noon to 3pm. 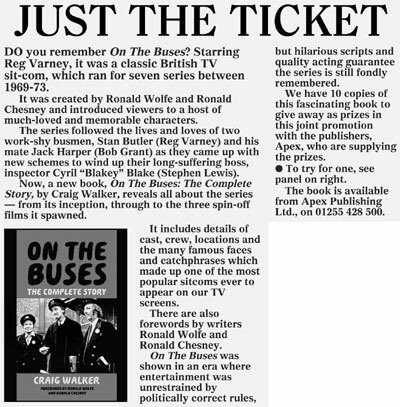 With a foreword written by the show’s creators Ronald Wolfe and Ronald Chesney, the book details the whole On The Buses story from its inception through to the three spin-off feature films it spawned. Craig said: “My motivation for writing this book was that as a lifelong fan of this classic sitcom, I had become frustrated that there was no books dedicated to On The Buses on the market, so I decided to write the book as a fan, for the fans. “I hope that the readers of the book will learn more about the show and it will strengthen their warmth of feeling for this British comedy masterpiece. “Personally, seeing this book published must rate as one of the most proudest experiences of my life. The book includes details of cast, crew, locations and the many famous faces and catchphrases which made up one of the most popular sitcoms ever to appear on our TV screens. On The Buses aired in an era where entertainment was unrestrained by politically correct rules, but hilarious scripts and quality acting guaranteed the series a legion of loyal fans around the globe. The author’s spokesperson, Chris Cowlin, said: “Craig has thoroughly researched this classic sitcom – the book is a remarkably in-depth reference work. A NEW book featuring much-loved late Budleigh Salterton resident On The Buses actor Reg Varney is released on October 3 2009. 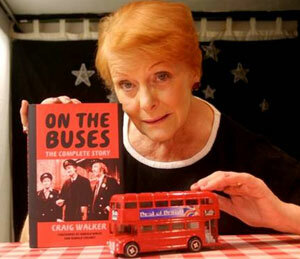 On The Buses, the complete story, by Craig Walker, tells the whole story from the show's inception through to the three spin-off feature films it spawned. The book includes details of cast, crew, locations and the many famous faces and catch phrases which made up one of the most popular sitcoms ever to appear on TV. Reg Varney lived in the town for many years after making it his home when he retired from acting. Sitcom fans are preparing to hop on board and enjoy a celebration of the Seventies comedy, On The Buses, which was filmed largely around Borehamwood and Elstree. Now in its fifth year, the “fun-filled” weekend experience will include bus tours of locations used for the popular comedy series, which ran on ITV between 1969 and 1973. Fans who turn up to the event this weekend at Fairway Hall, in Brook Close, Borehamwood, will also get the chance to meet stars of the show, including Anna Karen, who played Stan's dowdy sister Olive. The event, which commences at 9am on Saturday and 10am on Sunday, also includes screenings of episodes of the well-loved television series in the afternoon. Organiser Craig Walker said of the "suggestive" comedy series: "I think there is still a niche for this style of humour. "There is nothing of the sort nowadays and people who were not even born when it was aired still enjoy it immensely. "I was only a year old when it first came out and I travel down from Edinburgh to organise the event every year." 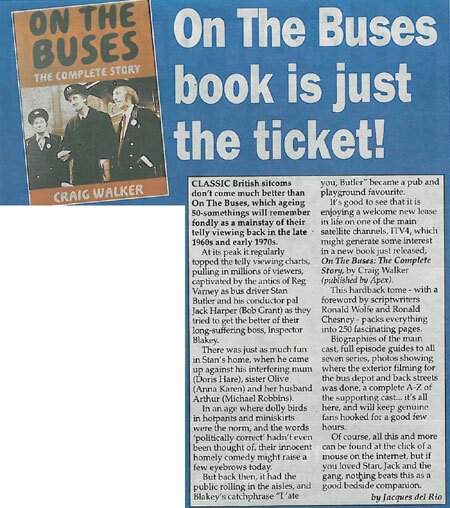 The 43-year-old, who is a self-confessed fan of the comedy, has written a book on the subject, On the Buses: the Complete Story, which was published in 2009. He also published a quiz book on the sitcom last month. More than 100 fans are expected to join the event this weekend, along with more than 15 celebrities, including cast members, film crews and scriptwriters. On The Buses used a wide range of locations around Borehamwood including Shenley Road, Leeming Road and Manor Way. in the series – from an Indian bus driver who grimaced in the canteen to a pretty passenger ogled on a bus by Jack. They certainly don’t make them like this any more. 16 May 2009 - Craig Walker was interviewed on Bristol Community Radio 93.2 FM. Craig answered questions about his book 'On The Buses: The Complete Story'. 6 July 2009 - Craig Walker was interviewed on Leith 98.8 FM. Craig answered questions about his book 'On The Buses: The Complete Story'. Craig was interviewed on 'The Graeme Logan Show'. 2 September 2009 - Craig Walker was interviewed on Leith 98.8 FM. 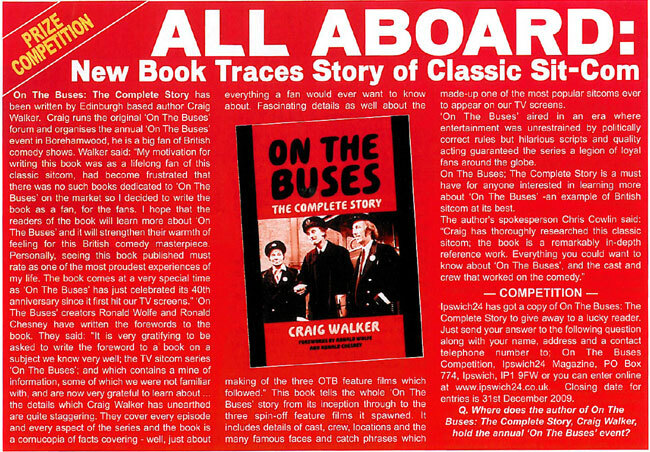 Craig answered questions about his book 'On The Buses: The Complete Story'. Craig was interviewed on 'The Graeme Logan Show'. 25 September 2009 - Craig Walker was interviewed on Salford City Radio 94.4 FM. 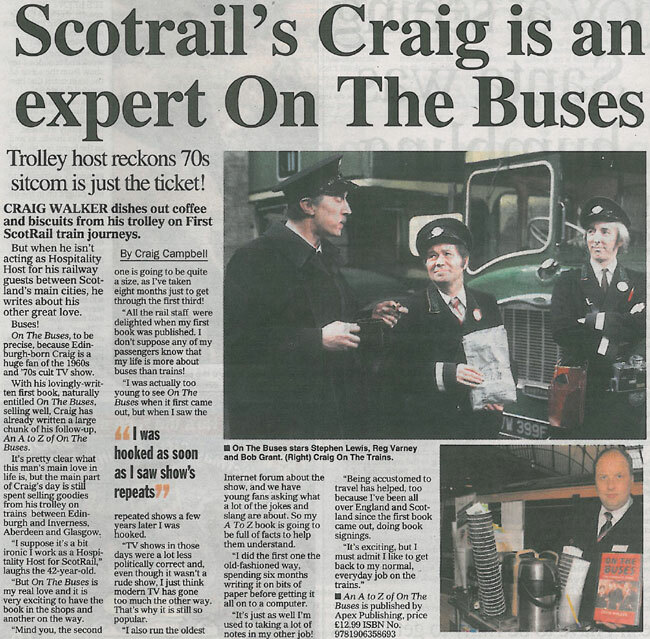 Craig answered questions about his book 'On The Buses: The Complete Story'. Craig was interviewed on 'The Chris Brophy Show'. 29 September 2009 - Craig Walker was interviewed on Swansea Sound 1170 MW. Craig answered questions about his book 'On The Buses: The Complete Story'. 29 September 2009 - Craig Walker was interviewed on Bath 107.9 FM. Craig answered questions about his book 'On The Buses: The Complete Story'. 1 October 2009 - Craig Walker was interviewed on Angel Radio 101.1 FM. Craig answered questions about his book 'On The Buses: The Complete Story'. 4 October 2009 - Craig Walker was interviewed on Magic 999 AM. Craig answered questions about his book 'On The Buses: The Complete Story'. 5 October 2009 - Craig Walker was interviewed on Wythenshawe 97.2 FM. Craig answered questions about his book 'On The Buses: The Complete Story'. 5 October 2009 - Craig Walker was interviewed on Hayes 91.8 FM. 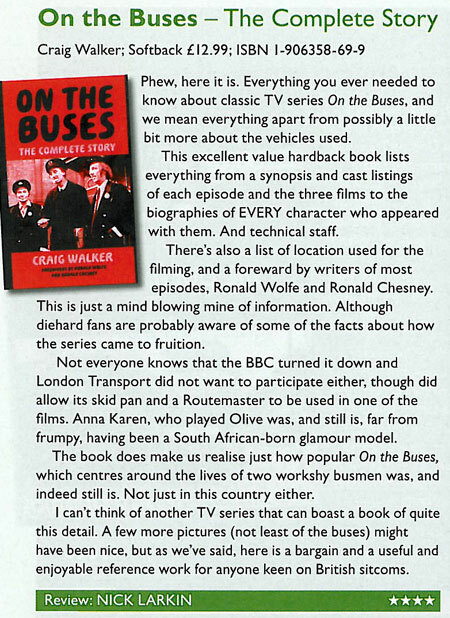 Craig answered questions about his book 'On The Buses: The Complete Story'. 5 October 2009 - Hal Dyer (Michael Robbins widow) was interviewed about On The Buses and Craig Walker's book 'On The Buses: The Complete Story'. 6 October 2009 - Craig Walker was interviewed on BBC Radio York 103.7 FM. 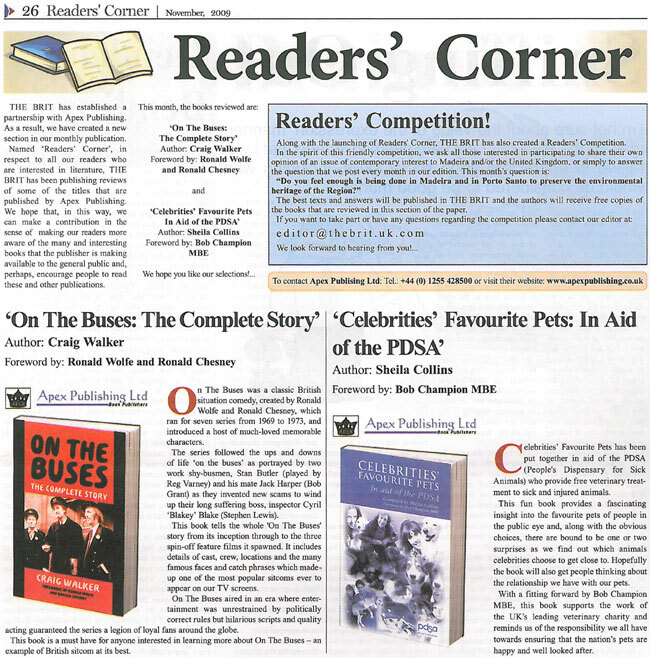 Craig answered questions about his book 'On The Buses: The Complete Story'. 8 October 2009 - Craig Walker was interviewed on BBC Radio Lancashire 95.5 FM. Craig answered questions about his book 'On The Buses: The Complete Story'. 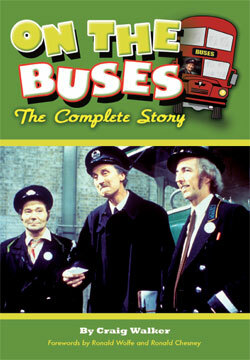 12 October 2009 - Midwest Radio 97.4 FM feature and run a competition on 'On The Buses: The Complete Story'. 13 October 2009 - Craig Walker was interviewed on BBC Radio Norfolk 95.1 FM. Craig answered questions about his book 'On The Buses: The Complete Story'. 14 October 2009 - Craig Walker was interviewed on BBC Radio Merseyside 95.8 FM. Craig answered questions about his book 'On The Buses: The Complete Story'. 14 October 2009 - Craig Walker was interviewed on BBC Radio Suffolk 103. 9 FM. Craig answered questions about his book 'On The Buses: The Complete Story'. 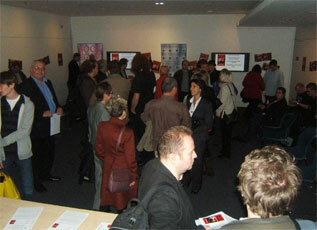 15 October 2009 - Craig Walker was interviewed on BBC Radio Solent 96.1 FM. 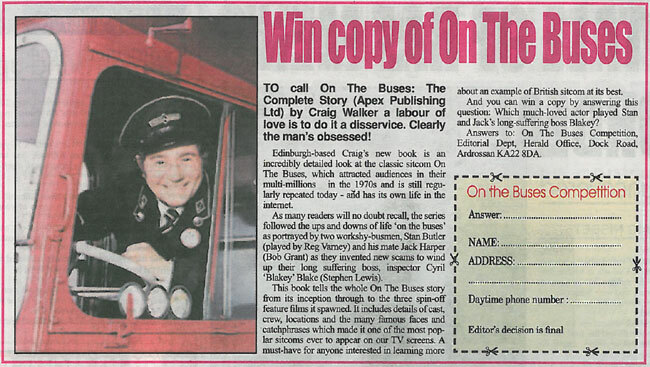 Craig answered questions about his book 'On The Buses: The Complete Story'. 16 October 2009 - Craig Walker was interviewed on BBC Radio Essex 103.5 & 95.3 FM. Craig answered questions about his book 'On The Buses: The Complete Story'. 17 October 2009 - Craig Walker was interviewed on BBC Radio Coventry & Warwickshire 94.8 FM. Craig answered questions about his book 'On The Buses: The Complete Story'. 18 October 2009 - Craig Walker was interviewed on BBC Radio Cumbria 95.6 FM. Craig answered questions about his book 'On The Buses: The Complete Story'. 23 October 2009 - Craig Walker was interviewed on Magic 1161 AM. Craig answered questions about his book 'On The Buses: The Complete Story'. 26 October 2009 - Craig Walker was interviewed on Wythenshawe 97.2 FM. Craig answered questions about his book 'On The Buses: The Complete Story'. 26 October 2009 - Craig Walker was interviewed on All 96.9 FM. 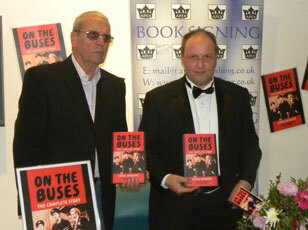 Craig answered questions about his book 'On The Buses: The Complete Story'. 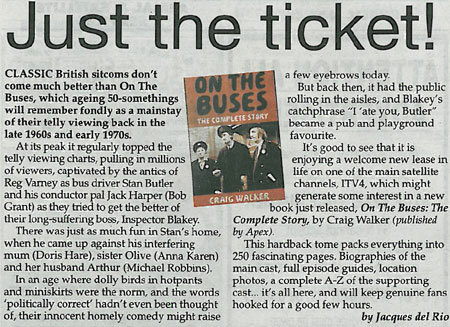 27 October 2009 - Radio St Helier review and feature Craig Walker's book 'On The Buses: The Complete Story'. 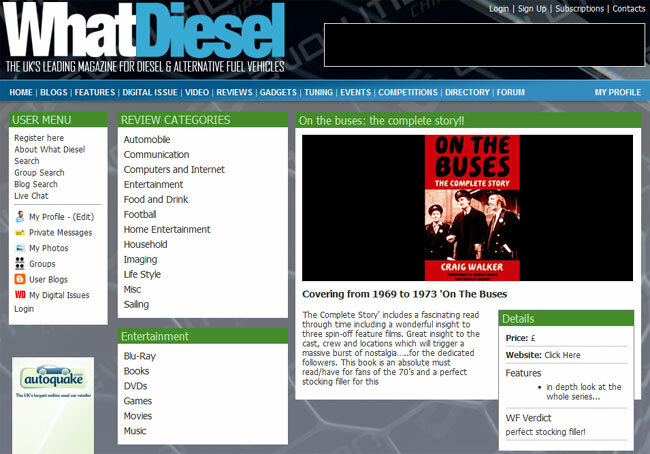 28 October 2009 - Isle of Wight Radio 107 & 102 FM feature and review Craig Walker's book 'On The Buses: The Complete Story'. 12 November 2009 - Craig Walker was interviewed on The Bay 102.8 FM. Craig answered questions about his book 'On The Buses: The Complete Story'. 18 November 2009 - Craig Walker was interviewed on Exeter 107.3 FM. Craig answered questions about his book 'On The Buses: The Complete Story'. Seaside Radio 105.3 FM Run a competition to win a copy of 'On The Buses: The Complete Story'. Craig Walker was interviewed on Clyde 1 102.5 FM. Craig answered questions about his book 'On The Buses: The Complete Story'. 20 March 2010 - Craig Walker was interviewed on BBC Radio Leeds 102.7 FM. Craig answered questions about his book 'On The Buses: The Complete Story'. 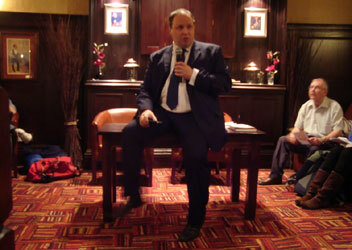 10 April 2010 - Craig Walker was interviewed on BBC Radio Surrey 104 FM. 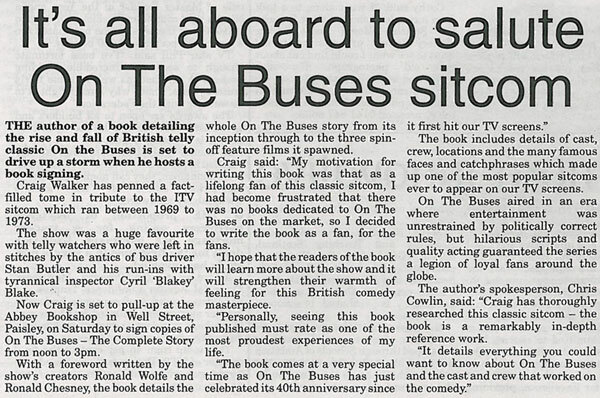 Craig answered questions about his book 'On The Buses: The Complete Story' on 'The Paul Ross Show'. 21 September 2010 - Craig Walker was interviewed on Talksport 1089 AM. Craig answered questions about his book 'On The Buses: The Complete Story'. 5 January 2016 - Craig Walker was interviewed on K107 FM. Craig answered questions about his book 'On The Buses: The Complete Story'. Craig was interviewed on 'The Graeme Logan Show'. I enjoyed reading the book and learning about the actors who appeared in the series. I really enjoyed the book, it brings happy memories for me when I was about 20 years old, the things that happen in the series, relate to when my mum and dad worked on the United Buses in Middlesbrough, from 1950 to 1980, they would tell me story about what went on, and watching it now is quite true to some of the story lines in each episode, when I lived at home, we would rush to see On The Buses, we never missed a series, my parents have passed away now, my husband and I watch it now on television, it brings back memories from when we were young, I will treasure this book always. A very enjoyable read. A comprehensive dealing of the subject. A comprehensive guide book that will be of particular interest to die-hard fans of the "On the Buses" series. Craig Walker signed copies of his book 'On The Buses: The Complete Story' at his official book launch at the London Transport Museum, Covent Garden, London. Craig was joined by many of the 'On The Buses' cast as well as the creator and writer of the sitcom, Ronald Wolfe. Craig Walker signed copies of his book 'On The Buses: The Complete Story' at his official book launch at the London Transport Museum, Covent Garden, London. Craig was joined by many of the 'On The Buses' cast as well as the creator and writer of the sitcom, Ronald Wolfe. 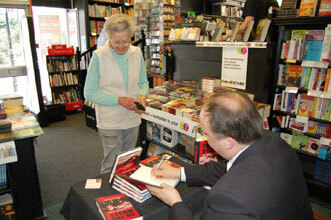 Craig Walker signed copies of his book 'On The Buses: The Complete Story' at Waterstone's, Huddersfield. 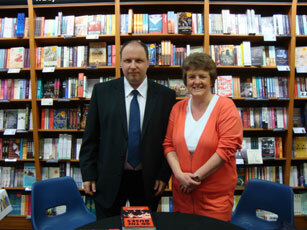 Craig Walker signed copies of his book 'On The Buses: The Complete Story' at Waterstone's, Leeds. 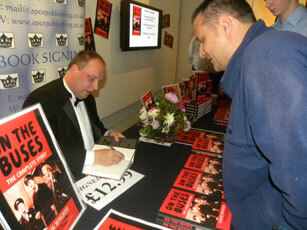 Craig Walker signed copies of his book 'On The Buses: The Complete Story' at Waterstone's, Bracknell. 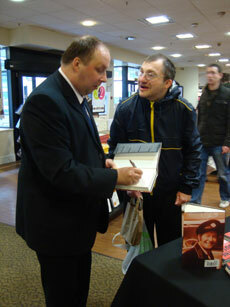 Craig Walker signed copies of his book 'On The Buses: The Complete Story' at Waterstone's, Sunderland. Craig Walker signed copies of his book 'On The Buses: The Complete Story' at Ian Allan Book and Model Shop, Waterloo, London. 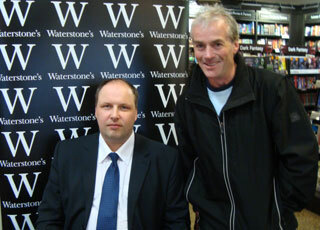 Craig Walker signed copies of his book 'On The Buses: The Complete Story' at Waterstone’s, St Andrews. 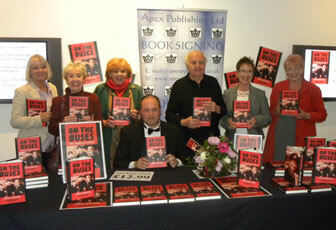 Craig Walker signed copies of his book 'On The Buses: The Complete Story' at Waterstone's, Dorking. Craig Walker signed copies of his book 'On The Buses: The Complete Story' at Saltaire Bookshop, Bradford. 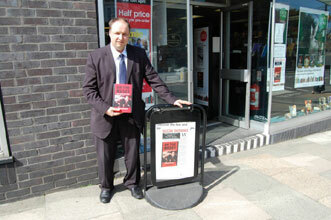 Craig Walker signed copies of his book 'On The Buses: The Complete Story' at Waterstone's, Epsom. 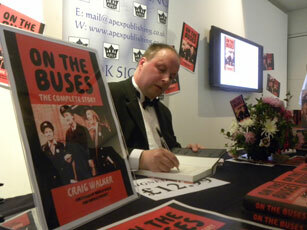 Craig Walker signed copies of his book 'On The Buses: The Complete Story' at Abbey Bookshop, Paisley. 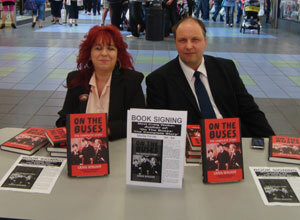 Craig Walker signed copies of his book 'On The Buses: The Complete Story' at On The Buses Event 2010, Borehamwood. 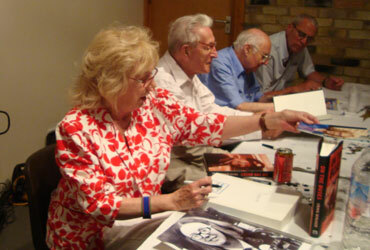 (Picture Right: Craig Walker with actress Anna Karen). 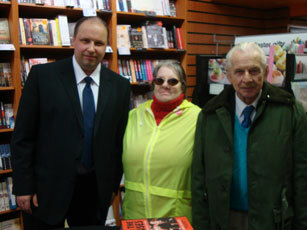 Craig Walker signed copies of his book 'On The Buses: The Complete Story' at Books Inside, Great Yarmouth. 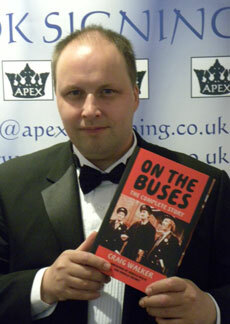 20 November 2010 - Craig Walker signed copies of his book 'On The Buses: The Complete Story' at the British Society of Comedy Writers 2010, London.